Our consciousness is bounded by our temporal horizons which, owing to the relatively brief span of an individual’s existence, are not long: circa 80 years for inhabitants of the developed nations. For many therefore, the concerns that preoccupy them are of an exigent nature and leave little time for deep reflection: the demands of work and family, and the need to maintain a healthy social life. These lead to a focus upon the short and medium term measured in days, weeks, months and years. Few think beyond these parameters, for they are either too busy, or temperamentally disinclined to reflection. Significantly, this observation applies also to the bulk of our politicians, whose actions are predominantly conditioned by their desire to generate positive headlines in the short term, and to secure re-election in accordance with the rhythm of the electoral cycle in the medium term. Anything more than five years hence is thus not considered to be of paramount importance in the mind of the career politician. Some people, owing to an interest in history, are able to think in somewhat longer timescales, of centuries and, in some cases, millennia. However, these temporal points of reference still constitute little more than the blink of an eye if we look at Earth’s deep history; at its geological record. Looking at the question of time through the eyes of the evolutionary biologist, the geologist and the cosmologist gives us a true understanding of the resilience of life on our planet, and an awareness of the vast fluctuations in average surface temperatures and atmospheric composition that put today’s agonising over hypothesised anthropogenic global warming into perspective. Whether or not the burning of fossil fuels contributed significantly to the small measured increase in global average temperatures during the closing decades of the Twentieth Century is very much a moot point, for climate models have not panned out as expected. Climate science is the child of meteorology, and although the parent has made clear strides towards greater accuracy in recent decades, forecasting the weather remains highly uncertain beyond four to five days in the future. Climate modelling is thus in its infancy, and having no other analogues of the Earth to observe, modellers have been compelled to fall back upon computer simulations from which to draw their inferences. Elsewhere in the Solar System, the two other terrestrial planets possessed of substantial atmospheres – Venus and Mars – function as poor comparators for the Earth for a host or reasons. Neither possesses a hydrological cycle, and the atmospheres of each are comprised predominantly of carbon dioxide, unlike the Earth, where nitrogen predominates and oxygen makes its vital contribution to sustaining life. 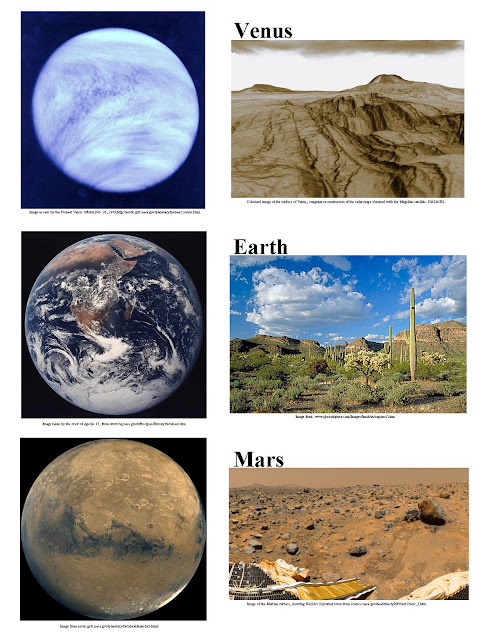 Moreover, whereas the atmosphere of Venus is far denser than Earth’s, with its pressure being some 93 times higher at the planetary surface, that of Mars is far more rarefied, being less than one hundredth that of the Earth. Venus alas is not Earth’s tropical twin as hypothesised in the 1950s, but an infernal place with a surface scorched beneath a crushing atmosphere rich in sulphuric acid at temperatures of 467ºC, whereas Mars is a frigid highly oxidising environment beset by seasonal hemispheric dust storms, where the protection of a spacesuit would be required to walk upon its surface because of the low atmospheric pressure. In the distant past, the Earth’s temperatures have varied widely, with some palaeoclimatologists subscribing to the ‘Snowball Earth’ hypothesis, in which it is claimed that most if not all of the globe was temporarily bound in ice, whereas at other times the poles once having experienced temperatures now associated with the Tropics. The average global temperature is currently 15ºC, yet in the past it has been 8-10°C higher and life survived. We currently live in an interglacial period, and the eccentricity in our planetary orbit and axial tilt means that another ice age will at some point be inevitable, and in geological terms, this should not be a long time in coming. Milanković cycles will ensure that ice one day spreads to lower latitudes and sea levels drop. Having thus set the scene, let us now return to the contemporary furore surrounding ‘climate change’. Many people feel uncomfortable with uncertainty and crave immutable truths even where they do not exist; such individuals are predisposed towards ‘faith’ rather than reason. In the debate concerning ‘climate change’ or, more accurately, the catastrophic anthropogenic global warming hypothesis (CAGW), one can discern two broad mutually antagonistic camps, which label their foes in the following derogatory fashion: ‘deniers’, for those who oppose, and ‘warmists’ for those who support the CAGW hypothesis. What doesn’t help the science is the fact that the debate has become intensely politicised, with anti-Western globalists who control the governments of the Western nations backing the ‘warmist’ side of the argument, and the oil industry supporting the ‘deniers’. Public trust in the scientific community initially received a significant dent with the release of the ‘Climategate’ emails, and this week, further emails have led to what has been dubbed ‘Climategate II’, with James Delingpole of the Daily Telegraph publishing a sample of these on his blog. One particularly damning email is reproduced below. Evidently, the sentiment expressed in this message cannot be adjudged to have been either neutral or objective in tone, as we would expect from a natural scientist. We may unfortunately have been long accustomed to such overtly politicised attitudes within the misnamed social ‘sciences’, but to see this creeping into the natural sciences is deeply worrying, for it risks undermining public confidence in science in general. When looking at these messages, it must be remembered that they express not any flaw in the scientific method, but a flaw in the characters of individual scientists who have chosen to place their favoured political causes ahead of objectivity. Given that the coming week witnesses the Durban Climate Change Summit, the timing of ‘Climategate II’ is unlikely to have been coincidental. Just as there are identifiable lobby groups which wish to push forward a global ‘development’ agenda that involves the deindustrialisation of the West and the transfer of wealth to non-Western states, so too are there lobbyists acting on behalf of the oil sector which sees the ‘decarbonisation’ agenda as inimical to its interests. Irrespective of the furore that this public debate may generate in the West, China will continue to plough on with its economic development by increasing its electricity generating capacity, often employing coal-fired power stations. For the West to deindustrialise whilst China, India and others continue their race for growth based upon hydrocarbon fuels is folly, for unless a real alternative to these fuels is found in the UK and other countries now averse to generating carbon dioxide, all this policy will do is hasten the economic decline of those countries that see themselves as pursuing an ‘ethical’ energy policy. The new models predict that given a doubling in CO2 levels from pre-industrial levels, the Earth's surface temperatures will rise by 1.7C to 2.6C (3.1F to 4.7F). That is a much tighter range than the one produced by the Intergovernmental Panel on Climate Change's (IPCC) 2007 report, which suggested a rise of between 2.0C to 4.5C. The new analysis also reduces the expected rise in average surface temperatures to just over 2C, from 3C. Even if one accepts the findings of these revised projections, it would make sense for the UK to place energy security at the top of its policy agenda and to reopen many of our abandoned coalmines with a view to achieving this. In the 1980s it was estimated that we possessed circa 300 years worth of coal reserves beneath our feet; moreover, diesel can be synthetically produced from coal if need be, thereby providing an alternative to oil imports; for new coal-burning plants, we could use emergent carbon capture technologies. Ultimately however, we do need to find new power sources, so research must continue apace into nuclear fusion and hydrogen as a fuel. Revitalising our domestic energy sector would generate tens of thousands of new jobs bringing wealth back to areas of our country that have been blighted since the pit closures, creating spin-off employment in the heavy-machinery supply chain and in other businesses required to support the sector. Prosperity could thereby be restored to areas of long-term unemployment and deprivation, creating a virtuous circle of development. It would also help us to choke off the flow of capital to Middle Eastern states such as Saudi Arabia that use their money to spread Salafist Islam in our country and others. Without oil, these theocratic rentier states would count for next to nothing politically, and their malign global influence would collapse into insignificance. Piers Corbyn: the Ice Prophet? Returning to the question of the forecasting of climate and weather, one man who has received considerable approbation amongst CAGW sceptics has been Piers Corbyn, who has appeared in the House of Lords in an effort to persuade peers that the assumptions of mainstream climate science are deeply flawed. His forecasting places great store upon solar and lunar factors and their interaction with other elements of the climate system, and his advocates claim that he is far more reliable in his forecasting than the Met Office. As Corbyn’s full forecasts are only made available to subscribers, and his ‘hits’ are remembered whilst his ‘misses’ are generally forgotten, it is not easy to ascertain if the claims with respect to his ability to accurately forecast months in advance stack up in his favour. However, his presentation to the House of Lords delivered on 26 October 2011, part of which is reproduced in the video below, made some startling claims with respect to this year’s winter weather in Britain. In his winter weather forecast for 2011-2012, he claims that it will be “exceptionally cold” in Britain from 27 November to 28 December, with “huge snowfalls at times” around 2 December and 14-15 December, with the cold being brought in by Arctic or North-easterly winds. Today is 26 November and there is no sign of Corbyn’s prediction coming to pass. It is still pretty mild for this time of year, and other forecasters are, if anything, forecasting milder rather than colder than average conditions over the coming weeks. Nonetheless, as of 25 November Corbyn remained bullish, stating that although the freezing blast had been “postponed”, it was still coming, and that his latest prognostications would be revealed at midday on 29 November. Whatever happens this winter or in the years ahead, one thing remains clear: climate and weather are intensely complex systems which we have yet to fully understand. ‘Climate change’, whatever the facts of the matter, is a politically charged term that is being used to achieve political ends which are not necessarily in our best interests. That said, finding alternatives to foreign oil should remain at the forefront of our policy agenda, with a view to securing energy security and prosperity for our people and our country. Make your Choice: Medicine or Islam? ‘A Potential Model for Europe’: Bosnian Islam!